New Style with Denim Jean Fabric. 30% more high-loft fill in inner stuffing bag than others. Any suggestions on how to improve this item is highly appreciated. Once adopted, a free improved item will be offered. Thank you. Any concerns or suggestions, please email us. We will revert to you ASAP. Made of high quality material, this pet bed is durable and practical for long time use. With soft cushion, this pet bed offers your pet comfort and insulation. 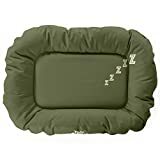 Additionally, this pet bed is washable, thus you can wash it to keep the bed clean and sanitary. It is worthwhile to buy such a lovely bed for your pet. Please choose the right size before you buy. if your return reason is size not suitable, we will only refund you 60% money, because we have clearly written dimensions.